The Very Rev. Father (afterwards Dean) Hegarty, parish priest of St. Kilda celebrated the first public Mass for the Catholics of Malvern in the new Malvern Town Hall on the third Sunday of September 1888. An earlier Mass had been said on the 3rd February 1888 at the recently established Convent of the Sacred Heart in Burke Road. In 1889, a site for a Catholic Church building was purchased in Stanhope Street for the sum of £1400. On 24th November 1889, His Grace Archbishop Carr blessed and laid the foundation stone for the new brick Church. In May 1890, he came back to bless and open the new Church which cost £1500. That Church is now the Church Hall and is used by the parish school most days. Soon after the Church was opened a movement was started to establish a Catholic Primary School, which was built of timber and located behind the Church. Father Hegarty from St. Kilda continued to say Mass. In November, 1892 three Vincentian priests, Fathers Michael Maher, Daniel McCarthy and Maurice O’Reilly arrived in Melbourne on the ship Oroya and were greeted by Father Cornelius McEnroe who had travelled down from Sydney. Subsequent, Fr. McCarthy went to Sydney and Fr. McEnroe remained in Melbourne. They took up duty in the newly created parish of St, Joseph’s Malvern. There is no record of the number of parishioners in the parish at its commencement but some idea can be gained from the collections at the two Sunday masses £4/1/8 and 7/4, respectively. In December 1907 the building of the current Church commenced with the Foundation Stone being laid and blessed on the 16th February 1908. The Church was formally opened and blessed on Sunday 27th September 1908. 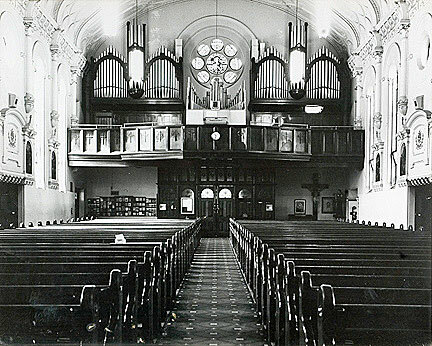 In 1917 a new organ, which filled the choir loft, was installed. On the 4th February 1912 the De La Salle Brothers arrived in the Parish. In January 1917 the Brigidine Sisters arrived in Malvern to replace the Sisters of the Sacred Heart, who had left at the end of 1916. In 1929 the Grotto was constructed and remains a place of prayer to this day. The church was refurbished in 1972, and again in 2006. A copy of The Story of the Church of St. Joseph’s Malvern 1908-2008 is available from the Parish Office.